Terrorism is the unconventional use of violence for political gain. Terrorism is the unconventional use of violence for political gain. It is a strategy of using coordinated attacks that fall outside the laws of war commonly understood to represent the bounds of conventioanl warfare1. Recently many people ask themselves what is the resaon of terrorism, why do people do all those awfull things... Terrorists acts may be intended to achieve political or religious goals, which include the spread of fear and mayhem. The terrorist who acts as a mercenary, or gun-for-hire, may also be acting for personal gain: for example. 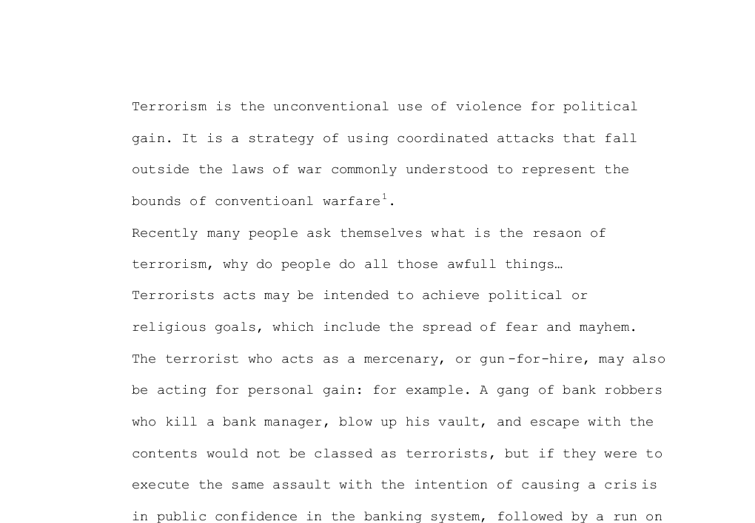 A gang of bank robbers who kill a bank manager, blow up his vault, and escape with the contents would not be classed as terrorists, but if they were to execute the same assault with the intention of causing a crisis in public confidence in the banking system, followed by a run on the banks, and a subsequent destabilization of the economy, then the gang would be classed as terrorists. 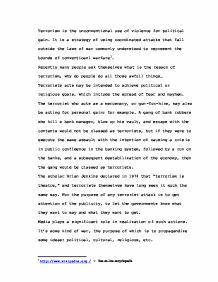 The scholar Brian Jenkins declared in 1974 that "terrorism is theatre," and terrorists themselves have long seen it much the same way. For the purpose of any terrorist attack is to get attention of the publicity, to let the governments know what they want to say and what they want to get. Media plays a significant role in realization of such actions. ...read more. More recently, al-Qaeda's strategy of not claiming responsibility for attacks-unlike earlier generations of terrorists-helps perpetuate insecurity and drive media coverage. The growth of satellite networks such as the Arabic cable news network al-Jazeera and of the video capabilities of the World Wide Web let terrorists make video recordings-for example, ones showing the murder of Daniel Pearl or Palestinian suicide bombers' last testaments-that can be seen even if CNN and the BBC decide not to show them. Terrorists have learned to use the Internet for secret communications among themselves, facilitating planning and fund-raising, and they have promotional Web sites. However, experts say that information flow on the World Wide Web is hard to predict or control, and the Internet isn't yet a way to reach everyone at once, as carrying out a spectacular televised attack is. However, rumors spread via the Internet sometimes filter up into other media. The great virtues of the Internet-ease of access, lack of regulation, vast potential audiences, and fast flow of information, among others-have been turned to the advantage of groups committed to terrorizing societies to achieve their goals. Terrorism on the Internet is a very dynamic phenomenon: websites suddenly emerge, frequently modify their formats, and then swiftly disappear-or, in many cases, seem to disappear by changing their online address but retaining much the same content. ...read more. for the effectiveness of the terrorists' message. The media should take a more objective role on issues such as terrorism, and realize that there are more important things in this world than 'getting ahead of the pack'. This may be impossible in our capitalistic society, but I think that it should be attempted. Government officials should think less of themselves and more about the people they represent and are responsible for. This may mean putting their reelections on the line, but I think that if a stance like this were taken more often, people would see the value in it and know that the government is acting in their best interests, and would respect them for that. The public must be informed on how terrorists manipulate the media and public opinion to obtain their goals. The public must learn to 'fight back' by making a conscience decision not to need to know all the details about everything. This is very difficult (if not impossible) to achieve, since arguing that informing the public and not letting them know everything is a contradiction. The war against terrorism is really the battle of balancing our right to free speech against allowing terrorists to continue manipulating the media. This is a very touchy subject that is quite difficult to resolve, but I think that if people are informed about how they (and the media) are being manipulated, they will keep an objective view and eventually put terrorists in their place by not allowing them to rule our lives. ...read more. The logical operators did not give me very good results; I think this is down to me not using very good search criteria. The advanced search brought up the best results out of them all, although the phrase search did produce a number of useful hits. Unemployment Rate: The U.S. Unemployment Rate was around 6 percent which was the highest since April 1994. Foreign exchange: U.S. Dollar was depreciated when compared with other major currencies in the world especially in Euro Dollar. The economic situation was not recovered since the world economic crisis in 1997. A badly designed and operated website may not be able to pre-select the candidates and this could flood the HR department with worthless timewasters' applications. The latest threat of recruitment is not only applicable to online recruitment. Especially for management or higher positions the potential employees might find themselves in trouble because of the World Wide Web. Games that promote decapitating police officers, chainsaw massacres and arson like the Grand theft auto series are essentially a "murder simulator" (web 2) and placed in the hands of the easily influenced e.g. young people, or someone that has the underlying capacity to commit an atrocity, it acts as subliminal "video game training" to kill. People now are able to 'watch' music on Sky TV, 24 hours a day. There is a huge selection as to what can be watched, including hip-hop, pop, rock and classical music. However, a decreasing number of people are learning to play instruments. Thomas and San Juan. All of which are a beautiful picturesque location, a perfect place for the perfect couple. Princess Cruises can perform marriage ceremonies onboard its vessels. There are wedding chapels on many of the line's ships, with ceremonies conducted by the ship's captain. 2 MARKETING COMMUNICATION TECHNIQUES * Certain type of games available wherein customer can win. Thus creating interaction. * Current style trends on the website. * Product information and online purchase. 3 SERVICES OFFERED * Technical Information about the products available. When I am in the shopping centre I use a lift to either go up a level or to go down a level to get to the places or shops in the large shopping centre that I came here to get or to do.